Nearly every stand-up comic has a classic joke or two about mothers-in-law. And while most of us can appreciate and perhaps relate to the humor, for many couples, the pain is all too real. According to researchers at Utah State University, nearly 60 percent of all marriages suffer from tension with mothers-in-law, most often between the wife and her husband’s mother. Instead of keeping your distance to avoid her scrutiny, try to relax, be yourself, and show her who you are. Make it a point to give your MIL a glimpse of your true character. (This is about showing, not telling.) Let her see your kindness, compassion, respect, generosity, gratefulness, loyalty, honor and love in your everyday actions. You may also need to let her in on your vulnerability. Share your hopes, dreams and fears. Be willing to confide in her, opening the door to mutual trust. Once she knows who you are and is secure in the depth of your love for her son, you have a much better chance of bonding with her in a positive way. She doesn’t have to be your best friend, but she can be an asset to your relationship with her son and a support beam for your marriage. 2. Find out who she is. Many conflicts come from not knowing or understanding another person’s background, belief system, values and priorities. Ask your man to share with you what he knows about his mother’s upbringing and early life. Where and how did she grow up? You might also inquire about his parents’ relationship. How did his dad treat his mom? What roles did his mother play? How did his parents communicate? Did they show affection? What were their parental and disciplinary styles? Now go get it directly from her. Spend some time in conversation with your MIL or future MIL—just the two of you—so that you can find out more and perhaps establish some common ground. Remember, though, it’s not a game of 20 questions, so don’t go about it like an interview. Engage her, over time, in natural conversations about life, just as you might with a new friend. Listen to what she says. Find out what her relationships were like with her mother, father and siblings. Ask about her fondest childhood memories, her wedding day, favorite vacations, and her experiences as a mother. Express interest in the way she currently spends her time, including work and hobbies. Discover what she’s passionate about and what topics are sensitive for her, e.g. politics, religion, animal rights, etc. The more you know, the better equipped you will be for future interactions and family gatherings. Sometimes knowing what subjects to avoid is the best strategy for keeping the peace. 3. Ask for and accept advice. As a new bride, you are eager to show your husband that you have it all together. But truthfully, your MIL is far more experienced in every aspect of life, and she probably knows your man pretty well. This doesn’t mean she’s always right, but she deserves to be heard. If she is offering unsolicited advice, try not to take it as criticism. Accept her advice and thank her for it whether you intend to follow it or not. And when the opportunity arises, do seek her counsel. MILs love to contribute knowledge and skills they have gained from the School of Hard Knocks. Recognize that she brings a different viewpoint from a different generation. You may not always see eye-to-eye, but by showing her that you value and respect her ideas, opinions and wisdom, she is more likely to be open to your way of thinking when differences emerge. 4. Never compete or compare. You don’t have to say it to convey it. Let your MIL know that you are not competing for her place in her son’s life. If she is a cook, then let her be the star in the kitchen. You can help, but don’t steal the show. Maybe she’s a decorator, an artist, or a fashionista. If you have common interests, by all means converse and share, but always hold space for her experience. Even if her taste and style is vastly different from yours, compliment her on both her natural gifts and acquired talents. Don’t criticize or undermine her efforts by trying to outdo or outshine her in any regard or by comparing her to any other family member, including your mother. This requires you to be secure in who you are and the roles you play in the family and in the world. Your part is completely separate from hers, unrelated and incomparable. Once you accept that, you will see that there is no competition, and everyone can relax. 5. Don’t air the dirty laundry. No matter how close you are to your MIL, resist the temptation to involve her in your marital disputes. If you put her in the middle, she is almost always going to side with her son. Even if he’s done something wrong, she may sympathize with you, but she has his back. Because that’s what mothers do. Long after the argument is over, she will forget his transgressions but remember your reproach. 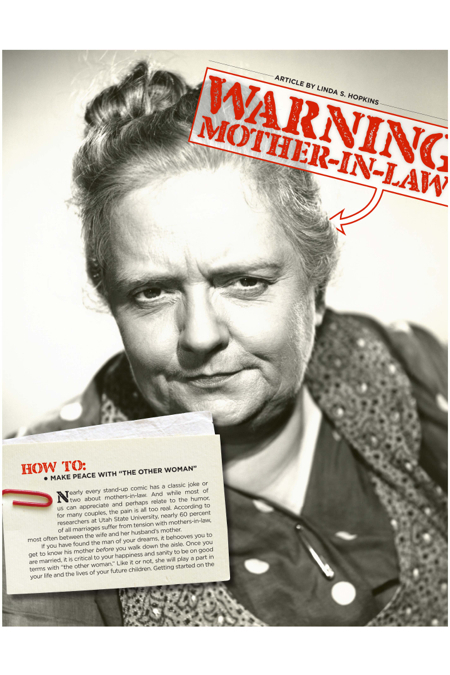 Over the course of your marriage, conflicts with your MIL are bound to arise. When they do, step back and try to be objective. Consider if her actions and words are coming from a place of love or fear. She may be well-intentioned but expressing herself poorly, or she may be struggling with feelings of insecurity, displacement or even loneliness. How might you make her feel important and needed? Her behavior may also be a symptom of issues she has with herself and/or with her son—matters that have nothing to do with you. If this is the case, it is your husband’s place to work on his relationship with his mother and your place to take nothing personally. Remember, it’s not about you. If your MIL is beyond annoying and her behavior is making you crazy, then it may be time to set some stronger boundaries. Suppose she is dropping in unexpectedly, overstaying her welcome, or demanding more time than you have to spend with her. Maybe she’s critical of your parenting style or she’s disregarding rules you have set for your children. Discuss these problems with your husband and come up with some clear guidelines about what is acceptable and not. The key is for the two of you to present a united front and to communicate with kindness. When hurtful words are uttered, be the first to apologize for your own inappropriate attitudes or comments, and be quick to let go of hers. Even if your MIL does not admit any wrongdoing, you can still forgive her. This doesn’t mean condoning the behavior, but releasing your anger toward her. Whatever situations arise, deal with them one at a time as they happen instead of allowing problems to accumulate and escalate. The most important factor in making a success out of a potential mess is to approach each incident with an attitude of grace and love. A mother-in-law is more likely to respect boundaries if she is reassured that she is an important part of the family and that you will continue to include her in your life. Remind yourself that having a good relationship with her is part of having a strong marriage and happy family. If she’s truly a mean, thoughtless shrew and you have tried your best to make peace, then you are within your rights to create more distance and space in the relationship by forgoing family gatherings and limiting visits. No one is obligated to tolerate abuse, and sometimes that means rolling up the welcome mat to protect yourself and your family.